The eNotes Blog: Our Calendar of Literary Facts is Now Live! 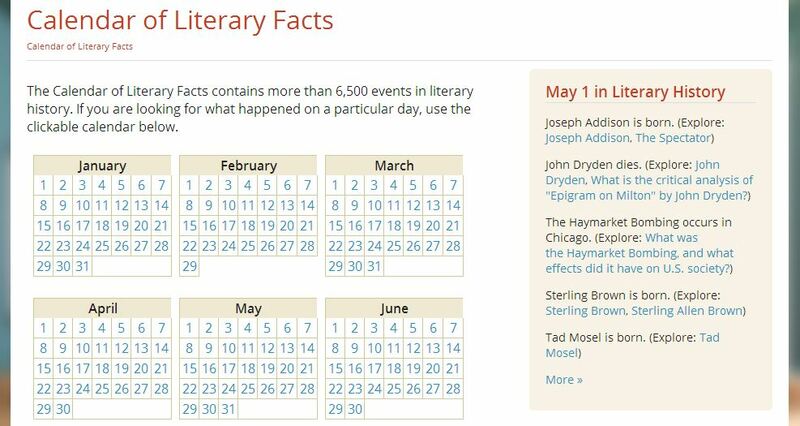 Our Calendar of Literary Facts is Now Live! At eNotes we’ve been working on a special addition, not only to our own website but to thousands of pages across the web. Presenting our Calendar of Literary Facts, now available to be published on your own site or blog with the code that we’ve created! See how it works on eNotes below, then read on to find out how you can bring this engaging calendar to your homepage. 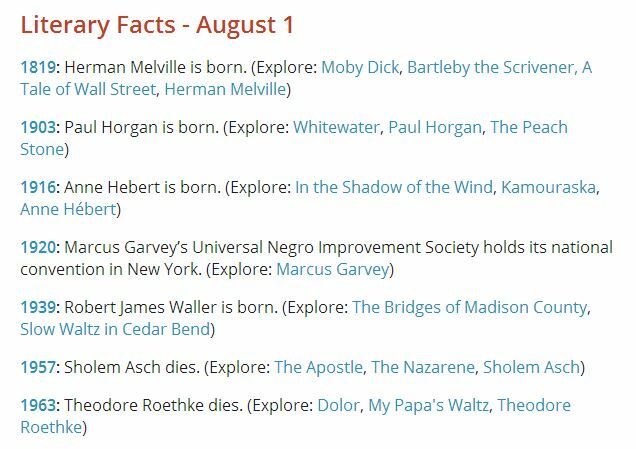 eNotes’ Calendar of Literary Facts collates a huge array of important dates in literary history. 365 days of the year, eNotes brings you interesting literary events (births, deaths, publications) that took place on that day, right on your eNotes dashboard. Alternatively, you can search our calendar to see what took place on a particular day. Beside these facts, the calendar also directs you to relevant pages to discover more about the people and events mentioned on that day of literary history. This makes it not only fun for those with literary interests, but a great teaching tool as well. Which is precisely why we’ve created the coding to share this platform with the world. Head to our eNotes API page at www.enotes.com/help/api to find the code necessary to bring the Calendar of Literary Facts to your site. At eNotes we’ve made our calendar available through a public API. This means that schools and other organizations (along with individual developers) can retrieve significant literary events for a particular day and month, along with links to related eNotes content for deeper exploration. Literature teachers with their own websites should consider this addition, as it keeps visiting students engaged while also directing them on to instructive material. To insert the code you will require an API key. For more on information on API keys, what they are and how to use them, you may want to visit stackoverflow.com, a site that has a large database of questions and answers on the topic. Or feel free to email us at dev@enotes.com! We’d be happy to help you bring the calendar to your site. We hope you have fun with the new addition! Check it out at www.enotes.com/lit-fact-calendar.